You never mentioned what Claudia said about meeting Snarkles. Lol. Nevermind. I’m surprised that not many people showed up. Then again, it was a Wednesday. You should read the Evernight series! It’s really good. I learned that Robin LaFevers loves Juliet Marillier!!! This is because you texted me during the event LOL and I feel like now Robin and I should be best friends, ya know? I wish we had more author events near me and also? BEA SO SOON!!! 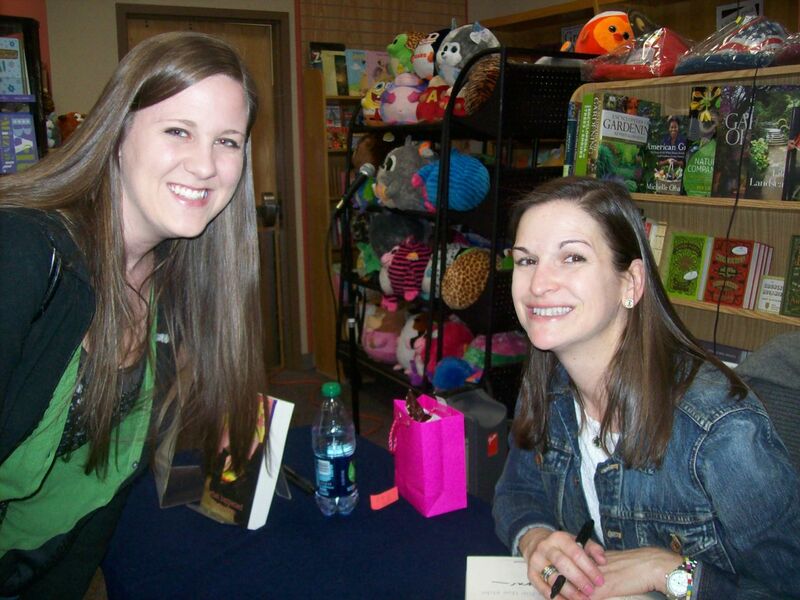 I love that picture of you and Sarah Dessen leaning towards each other! You should definitely check out Sarah Dessen’s books, I only read a book by her for the first time about a year ago and I’ve been slowly catching up. I will say space them out because while they’re definitely good, they all pretty much follow the same formula and it can get to be a little much. I’ve not read Grave Mercy yet, although it’s sitting on my shelf. I’m excited to read it though! How fun!! also, you’re super cute. 😉 My unphotogenic self is quite jealous. LOL! thanks for hosting the giveaway! I live in Wisconsin and have just started trying to look into author events nearby, and I can’t find any outside of Milwaukee and Chicago. Anderson’s Bookshop looks like it does host a ton of authors, so maybe I should look into it and be willing to brave the three-hour drive for an author I really want to see. I did want to see Robin LaFevers, but I found out about it that Friday and had plans. Oh well. That’s awesome that you live close enough to attend events there fairly frequently! I hope your May events live up to your expectations (and don’t get canceled randomly!). Would one of them happen to be Holly Black? I noticed she’s going to be there in early May and I’m pretty tempted, but I am too busy that day as well. 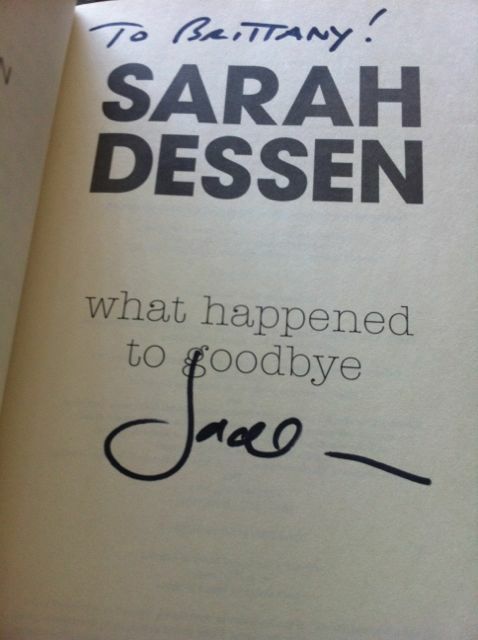 I loooove Sarah Dessen. I’ve been a fangirl for YEARS. I’m so jealous you got to meet her. 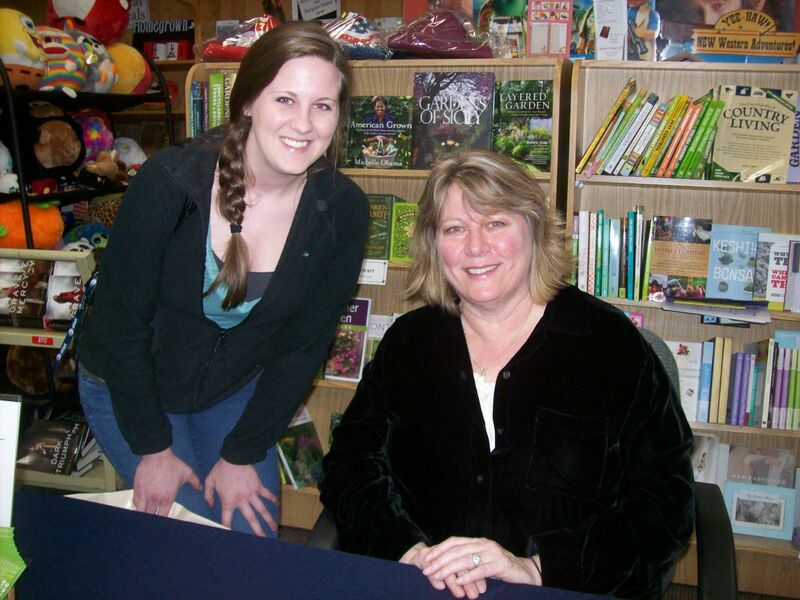 What awesome writers you’ve gotten to meet lately! 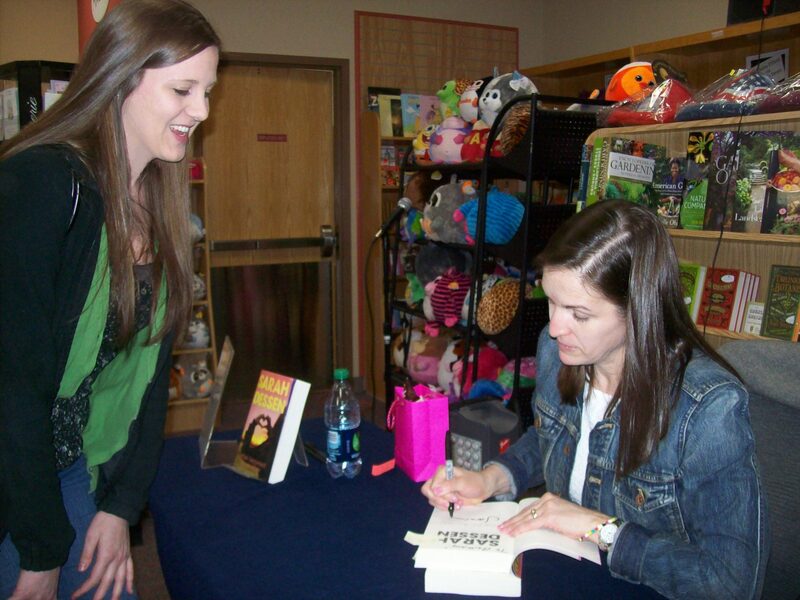 I wanted so badly to go to the Sarah Dessen event – I saw her once before – and her enthusiasm for what she writes is contagious! Thanks for the giveaway opportunity! You met a lot of awesome authors! One day I hope I can go to some author signings, it is hard when you live in a smaller city and usually they are all two hours away. 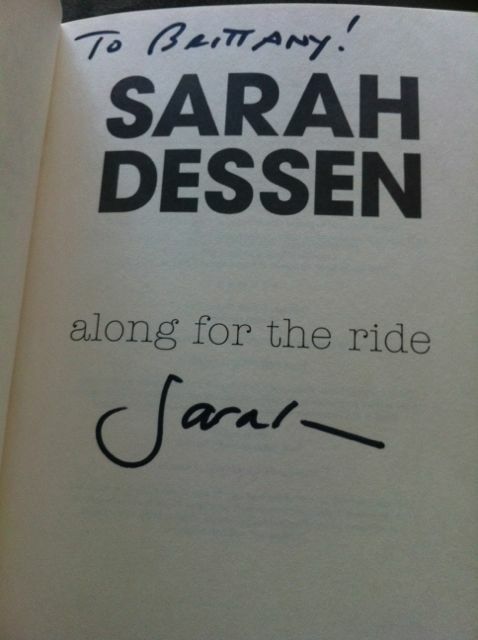 Sarah Dessen is awesome! I need to read some Rainbow Powell, I’m so out of the loop. I also NEED to jump on the Grave Mercy train. Thanks for the giveaway! I have been dying to read Eleanor & Park! I wish you could have had the chance to meet her! She seems like such a lovely woman! YAY FOR AWESOME AUTHOR EVENTS! It looks like the ones you went to were a whole lot of fun indeed, and I’m especially envious when it comes to Sarah Dessen. She’s one of my favorite authors, and I’m definitely hoping I get the chance to meet her at BEA! Also, you MUST meet Rainbow – she is awesome! I just got a copy of Dark Triumph and am dying to read it. 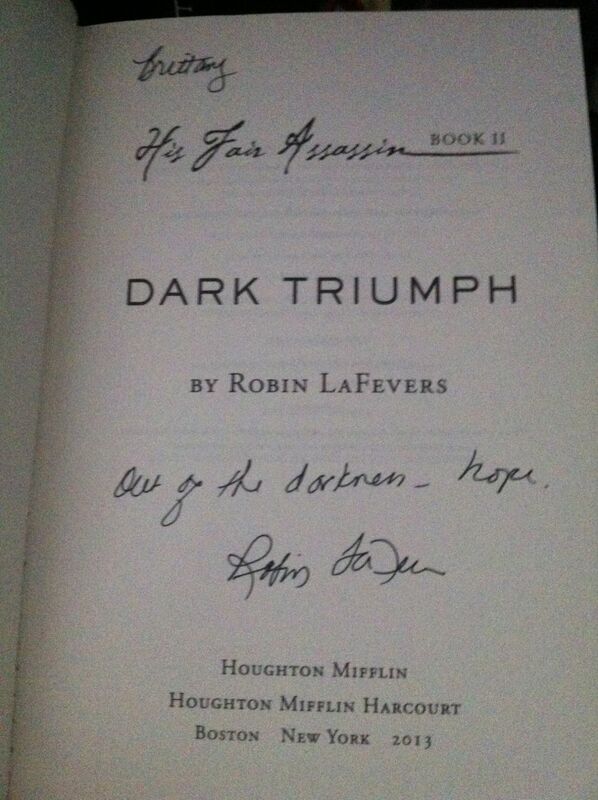 I’m so jealous that you met Robin LaFevers, how awesome! Thanks so much for the great giveaway and letting us learn more about some terrific authors. I’m wondering if you had to drive a long ways to go to these signings or if you live in a big city or something. I’d have to drive almost 3 hours to the next book even in my state and there are no authors that I’ve ever read let alone heard of that are going to be there. 🙁 It also doesn’t help that there are absolutely no bookstores near me. Anyway, I think it is awesome that you got to meet so many great authors! I haven’t read any Sarah Dessen yet but I hear her books are really good, and I’m impatiently waiting for my chance to read ‘Grave Mercy’. I didn’t know it was a historical fiction but I really love historical fiction so I think I will love it. Actually, Anderson’s bookshop (where I went to all of these events) is in the Chicago suburbs and I live one town over! Takes me about 15 min to get there 🙂 I’m just excited to have an amazing local indie bookstore that hosts events like these!! Grave Mercy is so great!! I really hope you enjoy it if you pick it up. Thanks for the comment!! I just went to an author event featuring Lauren Morrill and Lauren Oliver (I see they are coming soon to your area) and they were fun. Too bad about the Rainbow Rowell event being cancelled! That is soooo disappointing. 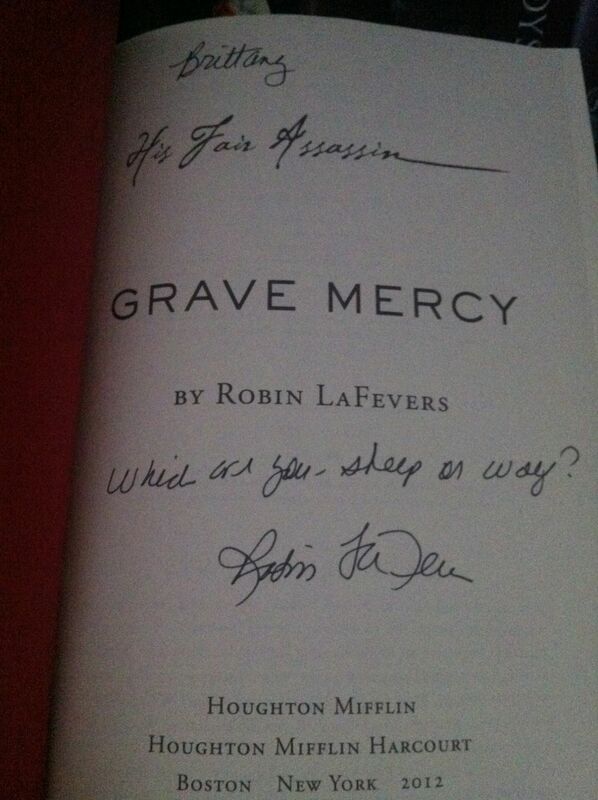 I will be seeing Robin LaFevers in May, so I really, really need to read Grave Mercy. Everyone says it is AWESOME. 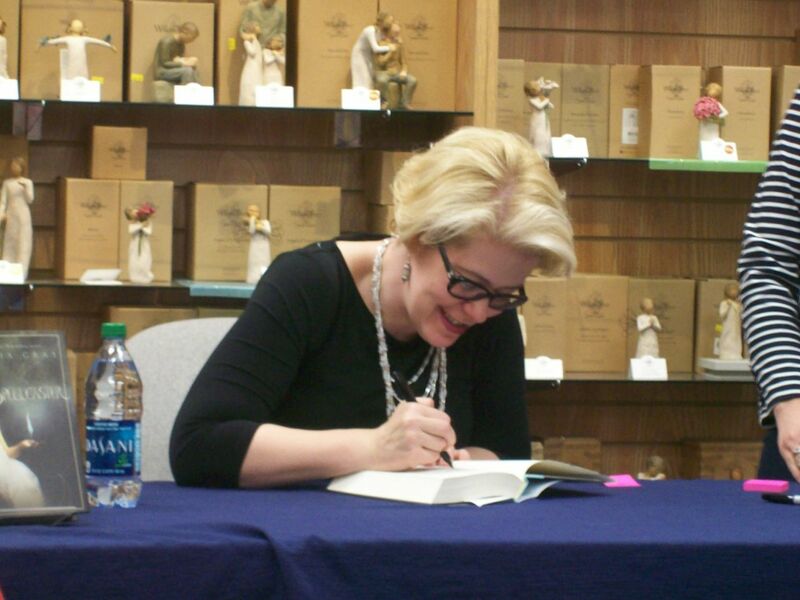 I wish I had more opportunities for author signings. They must come through Raleigh, I just don’t know how to get them on my radar! What’s your advice for knowing when they are coming? 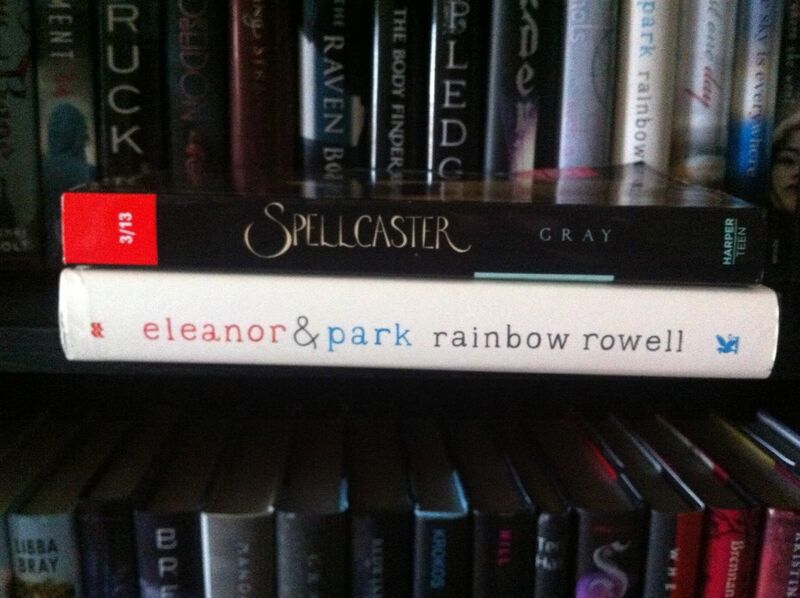 Also — I’m so excited about Eleanor and Park. I think it’s one of the only books on my 2013 top 10 “must read” list that I haven’t read yet. If I don’t win it, I’m buying it very soon!